Search the web for the DigiBarn using Google! Link your site to http://www.digibarn.com using one of our lovely logos! Want us to add a link to your site? Contact us! Alex's Apple Orchard, a wonderful collection and site by a young collector of Apple computers and ephemera. AllAboutApple, a great site all about Apple, in Italian and English. American Computer Museum, in Bozeman, Montana, USA, On Display: Thousands of Artifacts Spanning Thousands of Years of computing technology. Andy Molloy's Apple Computer Reading List, an excellent listing of books covering the history of Apple. Andy Welburn's wonderful Andy's Arcade of old arcade systems! Anthony Wood's Classic Basic Games site, an excellent resource including many original games written by Anthony and others. Also see his main site www.awsoftware.org for his Windows implementation of Classic Microsoft Basic with a classic BASIC game collection. The Apple Computer Collection from Philippe Poppe. A private collection started in 1995 and counts over 650 items today. See the complete collection but start with the “Important items” which documents the more iconic Apple products made by this now mythic company..
Applefritter the stupendous source on Apple computer history. Also see Apple I Owner's Club at Applefritte. Joe Torzewski's site on his Apple I, the ultimate source on the Apple 1 (thanks Joe). Archaic Apples, a superb site that includes much documentation, screen shots, and more about Apple and related companies and products. The Atari Museum is the culmination of years of research and hard work by enthusiasts with the support of numerous former and current Atari employees and is intended to provide images and information on all areas of Atari. The excellent BeBox Zone website, everything you ever wanted to know about Be! Al Kossow's superb Bitsavers site where you can find thousands of historic scanned documents and software. Bletchley Park, National Codes Centre, the English covert operations center housing the World War II codebreakers. See Bombes, Enigmas, and the rebuilt Colossus and the Digibarn visit to Bletchley Park here. Blinkenlights Archealogical Institute, a fun site on the history of computing, including a new exhibit on "what was the world's first personal computer"? Charles Babbage Institute Center for the History of Information Technology at the University of Minnesota. Commodore.ca an excellent Commodore Computer history site! Computer Collector (formerly Classic Tech E-Letter ) e-mail newsletter information page. The Computer History Museum in Mountain View CA and..
..see my pictures from my inspiring first visit to the CHM on March 2, 2001 (old Moffett Field location). The Computer Museum of America in downtown San Diego, a great place to visit, super online resources too! The Cray Wiki is a constantly expanding free resource dedicated to Cray Computer sytems, the company and the people behind the name. The Cray Wiki seeks to document every Cray ever made and make all this information freely available. Dan's 20th Century Abandonware, excellent site featuring no longer supported but not forgotten software (operating systems and applications). Dansk DataHistorisk Forening, a museum on the Danish IT industry, centered around RegneCentralen ("RC"), Dansk Data Elektronik ("DDE"), Christian Rovsing ("CR"). David Ahl at "Swap Meet Dave" - Bio and photos of Dave Ahl, founder of Creative Computing, author of Basic Computer Games (and self-described old curmudgeon). Also see David's Bio here. The Digital Mona Lisa, a masterwork of early computer graphics, circa 1965 (thanks for the reference Andy Patros). The EDSAC simulator featuring a simulator of the noughts and crosses game (tic tac toe) that ran on EDSAC (and other games that EDSAC might have run) and Donald Michie's MENACE machine constructed from 304 match boxes. This fascinating sytems was used by Michie to prove that machines could learn and is probably therefore the first dedicated AI "computer" ever constructed (thanks Mike Griffiths for these excellent resources). The First Computer Museum of Nova Scotia with its extraordinary collection of Kenbak-1 computers! Folklore.org, Andy Hertzfeld's incredibly insightful site about the history of Apple, written by the people who were there! Graphical User Interface Gallery GUIDEBOOK, a superb site by Marcin Wichary featuring a giant selection of GUIs and how they came to be. Heinz Nixdorf Museum in Padeborn, Germany, the largest computer museum in the world!, See their exhibit on women in computing (including Mary Allen Wilkes and the LINC) here. Herb's S-100 Stuff, New Jersey-based Herb Johnson maintains a comprehensive site about S-100 systems, documentation and vendors. Holborn computer system page by Bob A. Schelfhout Aubertijn (a Dutch Z80 computer system from Enschede). The Internet Explained an article on the history of the Internet by Vincent Zegna & Mike Pepper. The Jim Austin Computer Collection, a large collection of over 450 supercomputers to home computers in East Yorkshire, in the UK (from supercomputers to little computers!). The Machine Room, the Old Computer Database. Mick French's Collection of Obsolete Computers. The Microsoft Museum, see artifacts from Microsoft's founding in 1975 on up, and follow the stories of the peope involved. This museum is also a hands-on place for trying out all the newest gadgets from Microsoft and the PC industry today. Professor Hal Layer's Mind Machine Museum with amazing artifacts from the 60-80s including many homebrew projects and other early computers. The Mothership, an excellent site all about Apple (Mac, Lisa), including ads, downloadable historic software, timelines, columns and much, much more! The Museum of Computing at the University of Bath in Swindon in the UK. This is the only physical museum of it’s kind in the UK dedicated to the history of computing. Narita's Vintage Mac Museum (all done in the 68k Mac GUI!). Nathan Lineback's fabulous GUI Gallery, featuring screen shots of just about every PC Graphical User Interface (GUI) environment. Old Computers.com is a tremendous database of vintage systems with tons of statistics and user commentary, a truly great reference for computing history!. They also have a physical collection. This site is in France. An excellent multilingual site reviewing operating systems operating-system.org. 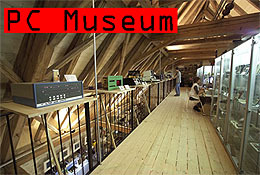 PC Museum is an excellent collection expertly displayed in a barn in Solothurn, Switzerland. 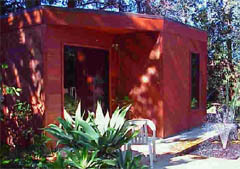 The Reale-Rydell Computer Museum, a newly completed facility which houses over 200 vintage and obsolete, but working computers. Retrochallenge an annual contest to restore the coolest retro systems. Rob's vintage Sun Microsystems computer page. Dan Halbert's SmallStar, a guide to programming the Star user interface included as a chapter in a book edited by Allen Cypher. Also see Allen's "Watch What I Do" book site. Sothius' Home including his Computer Museum. The Stanford University Computer History Exhibits at the Gates Computer Science Building with exhibits on all floors. The National Museum of Computing, housed in historic Bletchley Park (see our visit there!) , where Enigma was cracked, Colussus rose, and other seminal events in computing history ocurred. The Vintage Mac Museum is a private, working collection of the pre-Intel Apple Macintosh: 68k and PowerPC Macs, old Mac software, period advertising and memorabilia. 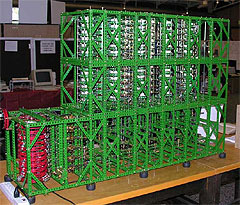 Tim Robinson's Meccano Computing Machinery web site, including a couple of Babbage difference engines made with... Meccano! Robert X Cringely's Triumph of the Nerds TV Series, a key inspiration for this museum. Uncle Roger's Classic Computers (a great collection of portables and more) and his computerhistory.net site, a collective of computer history web resources. Huge links library from the Vintage Computer Festival, the biggest annual gathering (in Europe and the US) for vintage computer collectors. Also see their Vintage Computer Marketplace for buying, selling or giving away vintage computer gear. The VCForum is launched! The VCForum (for Vintage Computing Forum) is a web-based threaded message board with a wide variety of forums already in place in support of the vintage computer community. Additional forums can and will be added as required by the community. It is our sincere hope that this message board will become a central gathering place for people interested in vintage computing and computer history on the World Wide Web. The DigiBarn thanks Erik Klein of Vintage-Computer for this important initiative! 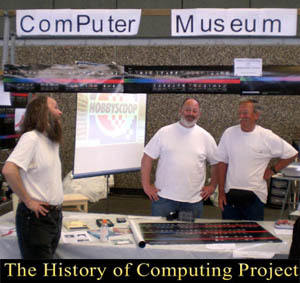 The Virtual Museum of Computing, a superb site with links to people, museums, collections and other documentation in computing history. The World Wide Web history project, the DigiBarn is proud to be a colleague of this great effort!. Woz.org, the source for all things Wozniak and Apple/Mac. Xerox and Xerox PARC history at the new parc, inc. website and a Xerox history timeline (in Flash). Damer.com, Bruce Damer's Homepage which covers all my wacky creative activities. For more on my history in computing see the About the Digibarn Computer Museum page and story of my life in early graphical user interfaces with Xerox and Elixir and recent activities in creating 3D virtual world cyberspace. For your interest, see my current work on virtual worlds and the creation of a new microeconomic structure termed a "Commons", and my latest writings and speaking schedule.